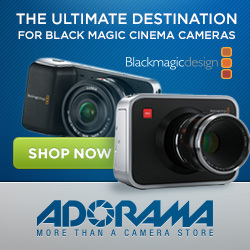 Hybrid Camera Revolution: Bear on the loose - no, it's not the Russians, it's the Blackmagic Ursa! Bear on the loose - no, it's not the Russians, it's the Blackmagic Ursa! This morning at NAB, while I was still enroute, Blackmagic dropped their latest bombshell. Two new cameras, the Studio Camera and the Ursa, for the pro TV and cinema markets. Hard to believe that the Ursa is $6495 for the PL mount version and $5995 for the EF mount version. Global shutter, Super 35 sensor, 12 stops of DR, a built-in 10' monitor, and dual CFast RAW or ProRes recording. Unlike some other bloggers, I am not upset that they didn't fix their existing cameras first. Disruptive companies disrupt. That's what they do. I have a Blackmagic Pocket Cinema Camera - it is an imperfect camera, yes - but for the image quality it produces, it is still a great value for the money. That said, unfortunately for Sony, the specs on this camera sound a lot like the specs on the $29,000 F55. Between the A7s' externally recorded 4K and the Ursa, it has already been a bad week for Sony - and it's only Monday. I am waiting to see the price for the HDMI Ursa - the DSLR/DSLM "dock" that will turn cameras like the Panasonic GH4 and Sony A7s into cinema production cameras. If you want to get on the waiting list for the Ursa (and knowing Blackmagic, you want to get on the list early, because it is likely to be a long wait), please click on the links above or the display ad below. It won't cost you anything extra, and it will help keep updates like this one coming. Thanks!